Know how to signal for help. If you ever become lost in the woods, wilderness, or anywhere outdoors, having a number of ways to signal for help could be a big difference if your survival depended on it. Most people are not prepared enough. That’s true in general. And it’s true while out in the woods. Sometimes you hear stories of people who got lost and had to survive with what they had and what was around them. The thing is, there are rescue signals that could help! Note: Although in many areas a cell phone will have service, don’t count on it. Especially in mountainous regions there may be no coverage. Or your phone’s batteries may drain (which happens rapidly while in fringe coverage). Tip 1: If coverage is weak, try sending a text message. They tend to work even when the signal is low. Tip 2: A satellite phone will work anywhere on earth. Apparently you can rent them. 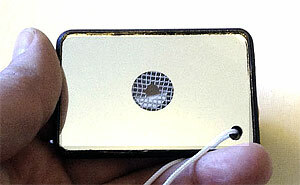 A small mirror such as a cosmetic mirror or a ‘real’ signal mirror will reflect sunlight towards a target. Consider keeping a specific made ‘signal mirror’ with a ‘spotting hole’ in the middle. Here’s instructions how to use a signal mirror. If you are in a vehicle, you might snap off the rear-view mirror and use it as a signaling device. If you have any CD’s in the vehicle, use them as a highly reflective surface to signal – or hang them on branches. 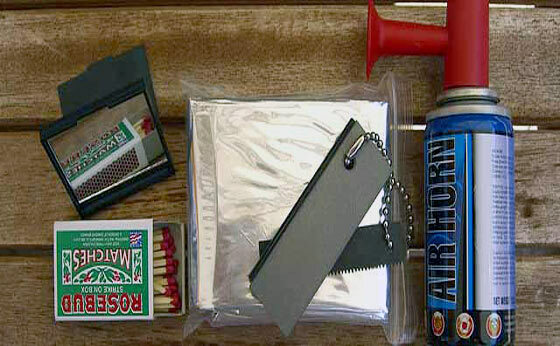 Have several ways to build and start a fire (matches, lighter, magnesium fire starter, FireSteel, etc.). When the fire is hot, you could drop some amount of green evergreen boughs on it which will produce a lot of smoke! Oil from your vehicle when spread on a fire will create lots of black smoke. Throwing a tire onto a very hot fire will create billows of smoke once the tire begins burning. An ordinary fire at night will create a significant infrared heat signature for anyone searching with IR / Thermal night vision devices. Please do not start a forest fire – use common sense! Tie some length of any bright colored material to a long stick or branch. Wave it around to signal rescuers. A bright object moving against an otherwise ordinary background will stand out quite well. You might use a bright colored shirt. Maybe a Tarp that you have with you. A Emergency Blanket is typically shiny. During the night, the piercing beam of a flashlight will signal your location from far away. Signal for help by flashing three times, pause, repeat. Some LED flashlights have a built in SOS or strobe function. Visible at night, a glow stick is relatively small, lightweight, will stay lit for many hours, and a potential lifesaver when needed. One thought is to attach one of these chemical lights to the end of a cord and spin it around. This creates a circular pattern if rescuers are potentially within sight. 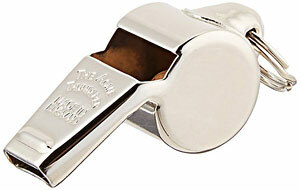 The sound of a whistle will pierce the air much further than your shouting voice! Keep a loud whistle in your kit! Although somewhat bulky, a small canister air-horn uses compressed air to screech a Very Loud blast horn. You can get these at most any sporting goods store. Simple to keep one in the car. A handheld 2-way radio is a great choice to keep in your bag / kit. You may be able to contact someone else who is on the frequency (typically FRS or GMRS). Draw a large S-O-S into the sand. Use sticks and logs or rocks to create a big S-O-S that can be seen from rescue planes above. In an otherwise natural setting, things that are out of the ordinary will attract attention. Be creative and use what you have on your person, in your kit, or in your vehicle to attract attention. A Mylar ‘space blanket’ typically has a highly reflective surface which will be very visible from above if laid on the ground (secure the corners with rocks so it won’t blow away!). Use your imagination with materials that you have on hand to attract attention. – 3 flashes of a light, in succession. It is internationally recognized that groupings of three may be an indication of distress or a signal for help. 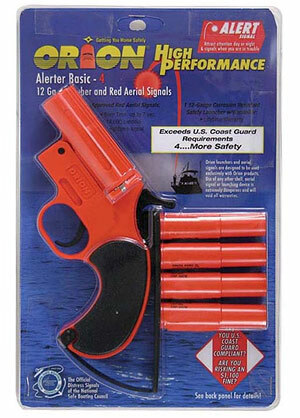 A flare gun is THE signal method for boaters on the water. I do not recommend using a flare gun in a dry forest because of the likelihood that it may start a forest fire. 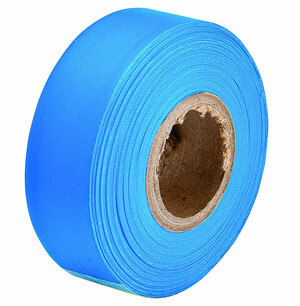 You might keep some length of survey tape in your pack or kit. It can be tied around trees for a signal. Use a Sharpie to write a message on it. 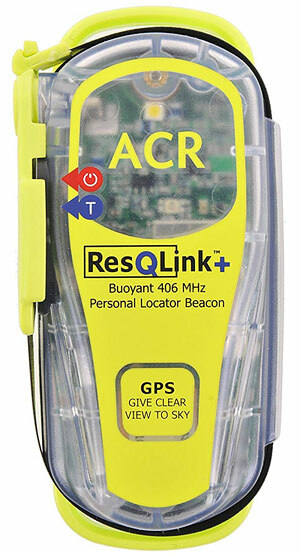 A Personal Locater Beacon (PLB) when activated will connect to one of the government search and rescue satellites and determine your position. This is transmitted to emergency responders. No subscription or annual fees required. Great ideas/reminders.—- a few weeks back, I read an interesting one. A hiker got lost in Canada. Very heavy snow/lots of trees. He looked around and noticed one (or more) of the trees had cameras on them. (these were some type of wildlife observation thing). He stomped out S.O.S. in the snow. The folks monitoring the cameras caught his sos, and notified the search and rescue folks. Quick rescue there after. — It brought me to mind, if one was lost, it would never hurt to try this, or as you say, any out of the place “group of three”. Also recently read about a man and his son (both adults) actually went up to a cave with a mother bear and two cubs in it. They killed them all, and thought it was “great”. They were caught, because the cave/bears were under 24/seven video surveillance as part of some monitoring program. —again, there are so many of these “cameras” etc around these days, both for monitoring wildlife and who knows what all, SOS or any group of three or anything “not natural”, would as you say be good. Color, Contrast, Noise and Movement are key to being located. In reference to the Sat Phone look up Satpaq dot com. It turns your phone into a sat phone. I don’t have experience with it so take it for what it is and that’s a possibile option. Blaze orange vest are a dollar. Anyone who leaves without one is foolish. We even carry them off season hunting and in our tac gear. Let’s say an EMP hits and you make it home 20 miles away. By the time you get there the significant other is jittery and armed. That vest or Mylar blanket will allow you to walk in close enough for recognition without getting shot especially if you’ve discussed it with them already. Smoke grenades that are cold burn units (won’t catch the pasture on fire) are available at places like Infidel Body Armor. We carry them on our vests and have discussed it for hunting. Look at Zello app for your phone that works like a walkie talkie. It runs on internet signal and will work even when text goes down “sometimes”. I love the ORANGE VEST recommendation. Thanks! It’s easy to take one with you, and is a great identifier. That aside, during hunting season I ALWAYS wear an orange vest over my clothes when out on the property, just in case! Even though I don’t expect anyone to be on my property who was not invited… Expect the unexpected. There has been more than once when I’ve pulled mine out to ward off another hunter especially during turkey season when you’re in full camo. I carry an extra on my deer cart to put over the deer too. Placing it on top of your vehicle can be a good contrast for an air search. Remember the orange markers used in Desert Storm? – I have one in my GHB or on me anytime I am out away from the house. Cheap insurance, even if I am doing something I don’t want to wear it. It will still fit in a pocket for when I am done and heading home. Thank you for the article Ken; is a good reminder to us to be the Boy Scout, “Be Prepared”. How true is that? Heck I even know people that would get lost in their own suburban ‘fenced’ back yard. Ok, something that needs to be a reminder. How many hundreds of times a year do people “Just go for a walk” and get lost? They take nada with them, sometimes not even a Coat. These people often times don’t even tell someone that they are “going for a walk”, so basically nobody knows when they left, where they were going, when they would be expected back OR even that they had gone somewhere/anywhere….. Even better yet, those Hikers and Hunters that “I know the area, so I’m good to go”. Yeah right, how does that work out for many hundreds a year that are found frozen dead in a huddle with a tree stump? If you are going to hit the woods, for crying out loud tell someone your plan, When, Where, How-Long, so-on, do NOT become a 10 second blurb on the news and a number added to the list of “Those that died in the Woods”. AND have at least the bare necessities in a Fanny Pack (or a real pack) to last a day or two in the clutches of “The Great Outdoors”. Don’t think it’s necessary? Try doing a ‘Lights Out’ weekend with absolutely nothing in your possession, not even a Coat. Remember if you’re lost and signaling, would it not be a LOT better if they were actually looking for you? Seriously, how many hundreds of times dose one see a smoking fire when camping and ignore if thinking it’s another Camper? Or hear 3 shots during Hunting season and think it’s your buddy that’s a lousy shot? OR even have someone hear/see your signal and say to themselves “I don’t want to get involved, it may be a Drug Runner’s camp fire”? On the flare gun, Orion also makes Sky blazer flares. They are comparable, cost less and do not require a gun to launch. Marine smoke flares are very good and rather expensive. Paintball smoke grenades are a lot more affordable. Pains Wessex distress signals are the gold standard for marine use. All marine distress signals have expiration dates and from personal experience on various 4th of July celebrations the Pains Wessex are good for many years after they expire. The others do not last as long. You get what you pay for and sometimes you can find expired flares for sale as training aids for greatly reduced prices. As an aside Pains Wessex also sells an illumination rocket that sends a white 90,000 candela flare to 1000 feet where it burns for 30 seconds under a parachute. Very reminiscent of the ones we used in Vietnam. On the flashlights I really like the 5 function tactical LED lights that are coming out of China. They have a focus able beam with high, medium and low settings as well as a strobe and SOS function. They do use the AAA cells and have the switch on the bottom. I have no idea how long the batteries last but I would think that on the slower SOS function they should last quite a while. I use lithium batteries in mine and I have at least a half dozen now. There are a number of different brands but they all appear identical except for the name. Amazon choice is Zonapa Tactical LED light 2 for $9.99 with free shipping. Don’t forget to go to Amaxon thru Ken’s link. 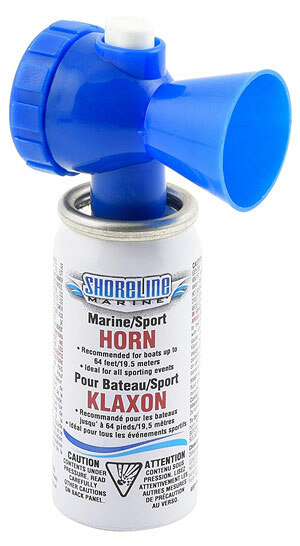 Talking about the horn, you show one that uses a compressed air canister. There is another type thar is louder and does not run out of air as long as you’re alive. It takes much less energy than even pressing the top of the canister type – and it weighs MUCH less. I bought mine at West Marine years ago. I is a cylinder about 2 inchees in diameter and about 8 inches long. It has a diaphram over one end and a very small hole in the side of the cylinder somewhere neaar the center of the length of the cylinder. To make the horn sound you just have to breath lightly into that small hole. This causes the diaphram to vibrate and make a VERY LOUD xound, VERY LOUD. Don’t blow into the hole, just breath very lightly, otherwise the sound will not be very loud. And if the diaphram breaks a new one can be made with a piece of plastic from a plastic bag, a piece of waxed paper, or almost anything else of that thickness. It doesn’t seem to be listed on the West Marine online catalog, but if you’re in a West Marine store show my description to a salesman and maybe he’ll know. Available from Amazon quite inexpensive. That’s the one he was referring too. We have one also. I’ve never been lost in the back country. , now I’ve not known were I was a day or two , but lost, me never ????? markers would always be a good thing when not familiar with a certain area or new area hiking in. I’ve always made up packs for my boys to have on them when going into the high country..always having a pack of gum with the foil wrapping and one battery you can start a fire also. always have a lighter ,9 v battery and cotton balls or steel wool and you can have a fire anytime , anyplace without the worry of no fire at all. a phone charger is handy also for emergency’s. the portable lightweight ones that hold a charge up to 15 hours are great. Handy to have in a tight situation.